London, Sampson Low, 1860. 2nd edition, with appendix. G F Train, an American, introduced the horse-drawn street tram into Europe, opening the first stretch of line in August 1860 in Birkenhead. This was followed in March 1861 by the first tram line in London, which ran down the south side of Bayswater Road from Marble Arch to Porchester Terrace, and by two further short stretches of line. Train produced a promotional pamphlet in early 1860, followed shortly thereafter by this second edition, which is more than twice as long. It contains copious correspondence and reports by the Author, together with further extracts from the press. 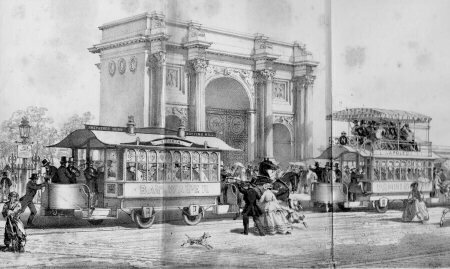 It has acquired a fine frontis showing "The improved street railway carriage" at Marble Arch. 8vo. viii + 114pp, folding litho frontis and 2 litho plates. Modern cloth. Frontis. spotted and repaired for tears.